Only then did we realize we had no idea when exactly bears lie down to sleep for the winter. According to this National Park Service site, Glacier's approximately 300 bears start hibernating in "late autumn." But when you think about it, the words "late" and "autumn" are pretty open to interpretation, especially given the contradictory facts that snow covered the ground (it's winter!) and the first day of winter is December 21 (it's definitely autumn). The best I can figure after extensive research (i.e. reading the NPS link above), the bears were either sleeping or in a state called "walking hibernation" during the time we were there. Apparently, about two weeks before the animals settle in for winter, they wander around half-sleeping toward the 8000-foot elevation where they'll eventually make their dens. In light of all the information/misinformation flying around (mostly perpetrated by me), I'm glad my father passed along this article, about a grizzly mauling a father and daughter in Glacier, AFTER we'd returned. Here are a few photos from our three days exploring the park on foot. Where the water meets the ground. 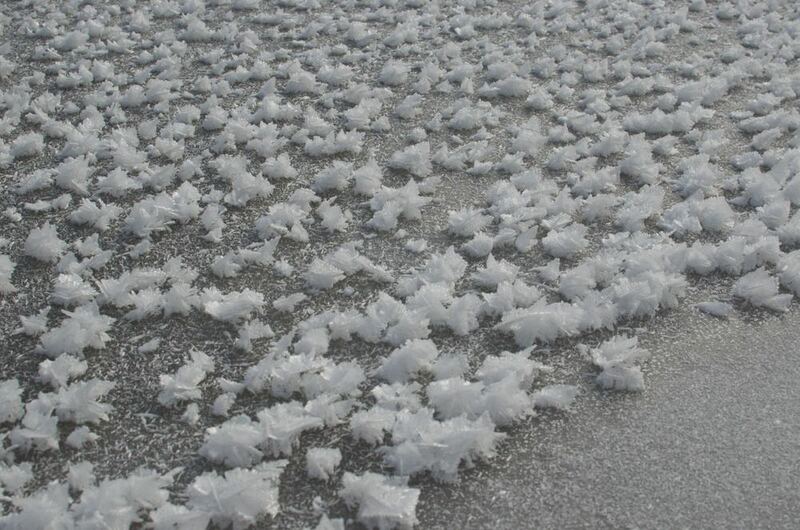 Delicate ice sculptures on the frozen water. 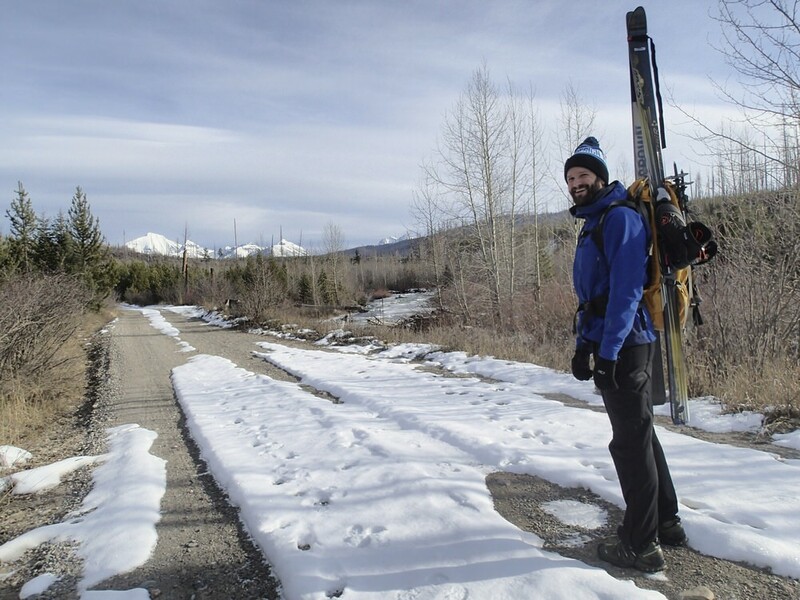 We had to carry our skis a couple miles along the 6-mile road from North Fork of the Flathead River to Bowman Lake, along the western edge of the park, before the snow got thick enough for us to put them on. Donnie, pumped about the snow we had yet to find. Donnie shredding the snow we found. Bowman Lake, the midpoint of our day. Headed back through the pine forests as the sun set. 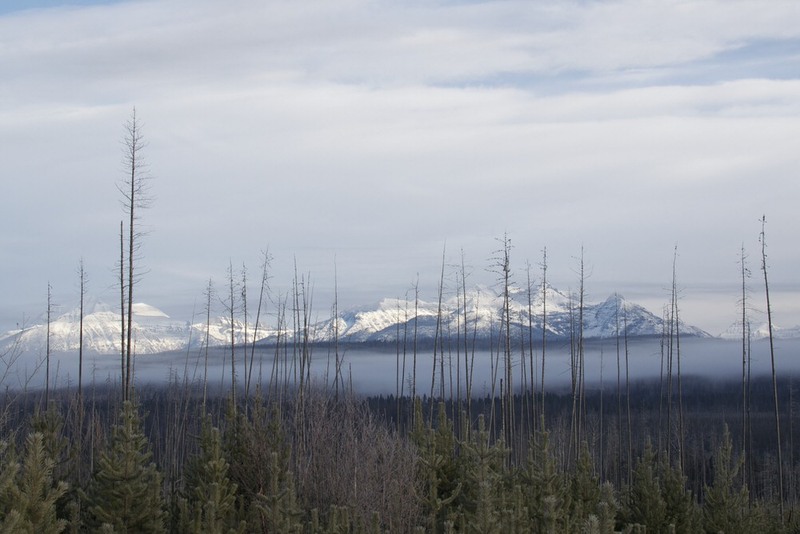 We hiked through freezing fog in the lower section of our straight-up hike to Snyder Lake. Once we ascended above the freezing fog, the trail became snow-covered, the weather sunny and the sky blue. Snyder Lake was beyond those trees and frozen. D. Kolb and a mountain that might be but probably isn't Gunsight Mountain.